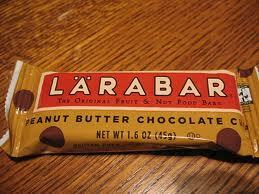 I have been wanting to make my own Larabars for some time now. Most of you know what I am talking about. Anyway, I always thought they would take forever to make and I didn't have time for something that took a long time. My husband kept telling me that our friends (you know who you are) made them so I jumped on the bandwagon and tried to make them. Super easy!! Normally, the bars cost about $1.25-$1.50 in the store. Mine cost me about $.96 per bar! Not too bad!! Mine had pitted dates, raw almonds, walnuts, dark chocolate pieces, vanilla extract, and it called for salt, but I forgot to put it in! They ended up tasting fine without it. First thing you have to do is choose what kind of nut you want to use. I decided to go with raw almonds since that was what the recipe called for. Typically, when I make something for the first time I don't stray from the directions. Once the almonds are chopped up nicely, add the dates. I used pitted dates, but you can use whatever you like. Then, add the vanilla extract and salt. The recipe called for salt, but to be honest, it didn't need it. The bars you buy at the store do not have salt in them. If you want to use dark chocolate chips stir them in now. The last step is to place them in an 8 x 8 pan and pop them in the freezer for about 15 minutes. No need to cover them. Oh and a little tip - place wax paper in the bottom of the pan so it will be easy to lift out! I didn't take a picture of them cut into bars, but they were delicious. You can find the recipe here. We have already ran out of these and I made some more today. I followed the same recipe, but instead of just almonds I added walnuts, pistachios, almonds, and cashews. No chocolate or salt this time. I didn't forget the chocolate or salt, I just didn't want them this time. Although I did forget the vanilla extract! They still taste yummy! I would like to try making them the next time with some shredded carrot! Well, I hope you will give these a shot. You will NOT be disappointed. I did dates, cashews, pecans & some mini chocolate chips over the weekend. Love! They are so versitile! Can I publish your submit to my blog? I'll add a one way link to your forum. That’s one really sweet post.